Home / Books / Happy birthday Oscar Wilde! How It’s New York: Oscar Wilde toured America in the ’80s (1880s, that is), and it was on his trip over that he famously said “I have nothing to declare but my genius.” There was for a long time an Oscar Wilde bookstore in New York, now sadly defunct. Oscar Wilde was born on this day in Dublin in 1854. Now a beloved fixture on coffee mugs, tote bags, the wall of Barnes and Noble, it wasn’t so long ago that there were only a few biographies of him on the shelf, and librarians looked puzzled if you asked about any others. When I write “it wasn’t so long ago” I mean, when I was a child. I just had a birthday so I must insist it wasn’t so long ago. Oscar Wilde, to those who have not read him, has been morphed a little bit into a kind of late Victorian Noel Coward, louchely smoking a cigarette and exhaling witticisms. But while he was, no doubt, often the life of the party, it’s a grave mistake to think of him as a kind of “Queer Eye for the Victorian Guy” fun campy sidekick. He was a big man, over six feet tall, with a swagger, could well defend himself, and his touches of effeminacy were considered affectations by everyone. When I was growing up, my favorite story of all time was “The Canterville Ghost.” I had found it in a collection of ghost stories that was on and off the shelf at the Millburn Public Library (and by the way, none of the movies do it justice, because a great deal of its charms is in the words, which vary from poetic to comic and back), because at that time the library was a small building on the corner of Essex and Lackawanna and the Children’s Room didn’t really have enough space for all of the new books. So the anthology this story was in was sometimes there and sometimes in storage. I could never remember the name of it (and can’t now) so when I did find the book again it was a great gift. I loved this story of Violet, “a little girl of 15” who moved with her American family into a haunted mansion and had little patience with the drama-king of a ghost, Sir Simon, who kept borrowing her paints to make blood stains after their good American detergent got rid of the one on the carpet. Does that sound like “Queer Eye for the Straight Guy” to you? I loved this story so much I used to try to tell it at summer camp, but of course, couldn’t remember most of the wonderful details. Then a couple of things happened. I found the book again, and saw the name, and it was so familiar I thought it was some modern comedian I might have seen on Johnny Carson, sneaking around the door of my parents’ bedroom. I was sure I knew who it was. And then the BBC series Lillie had the character of a young, dashing Oscar Wilde, played by Peter Egan. From that moment on, I was determined to find out everything I could about Oscar, but my way in was the sentimental, romantic, spiritual person, and later the philosopher. It was his humour, like a ghost using paints to make bloodstains, not his witty digs, that hooked me, and still do. I wrote high school papers on “The Ballad of Reading Gaol,” only to be sniffed at that Wilde “wasn’t a great poet” (humph. Check out Seán Tyrrell’s lovely rendition of The Ballad in his new album, The Walker of the Snow). Later on, in college, I prefaced as many papers for my English major as I could with an Oscar Wilde quotation, particularly in classes with Dr. Regenia Gagnier, who is a Wilde Scholar herself, and wrote Idylls of the Marketplace: Oscar Wilde and the Victorian Public . We used to giggle at each other across the seminar table. 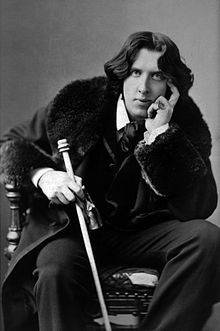 This past June I gave a paper on Oscar Wilde as an Irish comedian at Drew University here in New Jersey during their conference on “The Legacy of Oscar Wilde.” I’ll put that up at some point too, I hope. I maintain he got me into Stanford because the essay question the year I applied was “what character would you meet if you could go back in time,” and not only did I have my answer ready, I’d had it ready for years. I wrote something about how I would like to meet Oscar Wilde, who was a serious thinker and philosopher. Happy birthday to my dear, darling Oscar!